Tru School Sports: Where Is The Love, Dwight Howard? 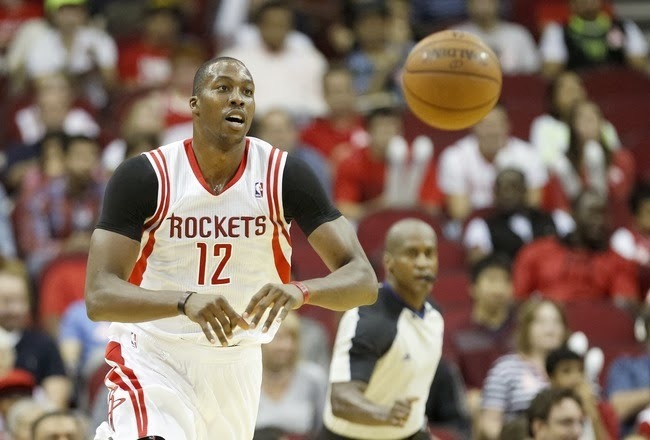 Dwight Howard with his new team the Houston Rockets. Every athlete in professional sports is either liked or disliked by social media. For some people, it's the way they act off the field. For others it's the way they act on the field. Their performance seperates them from others in their hearts. For whatever the reason though their seems to be a recent criticism for one player in the NBA: Dwight Howard. I hear a lot about how he is a baby off the court, and while I don't necessarily care about that I do understand the dislike for Dwight. What really irritates me, with not only Dwight but with plenty of players, is that people take knocks at his game because of the way he's playing. If those names sound bad to you, I suggest you start watching NBA network, or maybe basketball in general. Another piece of criticism I hear of Howard is that he's played terribly since he left Orlando. Coming from a guy who won his fantasy league last year and having him on his team; you're very wrong. There is literally no way you can convince me that 17.1 ppg, (third among centers) shooting .556% from the field (second in the NBA) with 2.4 blocks per game (fifth in NBA) and 12.4 rebounds per game (first in NBA) is a terrible season. You may be able to consider it a down year for someone of Howard's high profile, but that's still the kind of year every modern day NBA center dreams about. The last piece of social media hatred I would like to shoot down very quickly is the #BeforeDwightGetsARing trend that likes to go around. I would just like to remind the LeBron James haters that were huge fans of "Retweet if you have as many rings as LeBron" when he had none, that you all hid behind your keyboards and told us all how you believed in him from the start. I was hoping that he had made an example out of his ignorant critics, but it looks like we'll have to wait to embarrass the rest of you if the NBA's best center does bring Houston a championship. Also, Dwight Howard has no bad hairline to criticize either. Oh, and one thing for the Lakers fans that love that picture of Kobe dunking on Dwight while he was in Orlando. Have any questions or comments or hatred for me for defending him? Comment below and tweet me at @ItsMitchellO. All of those centers have one thing Dwight doesn't, a ring. Until then he is just another big man that can't shoot, and of course he leads in FG % all he does is dunk and shoot close to the bucket.